Product prices and availability are accurate as of 2019-04-23 15:04:35 UTC and are subject to change. Any price and availability information displayed on http://www.amazon.com/ at the time of purchase will apply to the purchase of this product. There's a new way to feel beautiful, and it's not from a cream or lotion. One serving of these delicious gummy vitamins provides 2X the biotin, 4X the antioxidant vitamins C & E, and 12 essential nutrients to support luxurious hair, gorgeous skin and healthy nails.+ 5,000 mcg Biotin, 90 mg Vitamin C and 60 IU Vitamin E, Infused with natural raspberry flavor and Gluten Free. 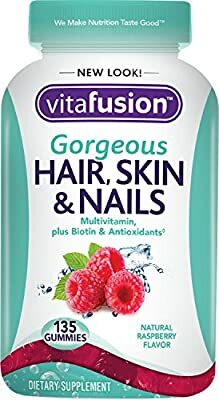 Unlock your inner beauty with Vitafusion! Take only as directed. Do not exceed suggested dosage. If you have a medical condition, are on medication or are pregnant or nursing, please seek the advice of a qualified health care professional before using. Do not use if inner seal is broken or missing. This product may settle during shipping. Do not expose to excessive heat or moisture. Color will darken over time. This does not alter the potency of the product. KEEP OUT OF THE REACH OF CHILDREN.